Stora Teatern in Gothenburg - The old theatre in Goteborg, Sweden. In the middle of the 1800´s it was a place for theatre and after 1920´s is was more famous for it´s music theatres as opera and musicals. Grand Theatre is a historic building in Gothenburg, this makes that we even today can enjoy dance, concerts, film and theater in this lovely historic building. You can not miss the fine white building if you walk around the city center. 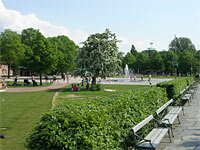 The theater is located at Kungsparken next to the Avenue. 100 000 swedish riksdaler but the costs became more expensive, 380 000 riksdaler. The building is built in renaissance style. In year 1880 the theatre gots it´s present name, Stora Teatern. Architect was Bror Carl Malmberg. Malmberg wanted to built both a scene house and a salon under the same roof. The building has been renovated through out the years but the original round salon is still intact. The sculptor Carl Ahlborn has made the stucco and the paintings and the ornament. All theatre activity move year 1994 to the new built Opera house in Gothenburgs harbour. 2000 the building was renovated and bought by SAMI (Swedish artist and musicans organisation). After the new inauguration 2003 they offered concerts, party and conference premisis and also a restaurant in the building. 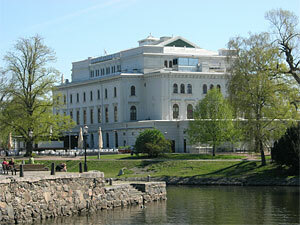 Currently operating the Great Theatre is Gothenburg's cultural administration. In 2012, after some years of closure moved part of Pusterviksteatern activity into the premises. Stureplansgruppen runs the restaurant business. In the basement you can visit the restaurant, Gropen. In summer you can sit outside Storans outdoor dining, "Storköket ute"
is the small park in between Trädgårdsföreningen and Stora Teatern. The park previously consisted of a round pond in the middle, but was rebuilt in 2014 to become a fountain with many jets of water and the pond became a slab on ground where the water sprinkles over. 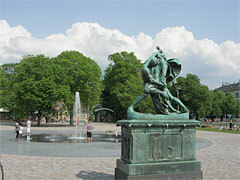 The park came into being in the early 1800s when the Gothenburg fortifications demolished. 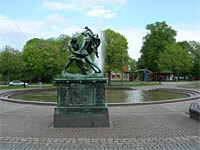 The Park has got it´s name after the sculpture of Johan Peter Molins "Bältespännarna" who was placed at it´s present place 1914. The pond was created during the late 1980s but was replaced in 2014 by a slab on ground where a fountain spreads its waters. Dec 21, 1973 Stora Teatern was declared as a historic building. It is the exterior and the theatre salon with belonging scene and the first row foyer that belongs to the historic building. In the basement is also the venerable old restaurant , Gropen.